Thanksgiving is right around the corner and while I would never tell you to skip the pumpkin pie and wine, it is important to remember that moderation is key with sugary foods and drinks. What isn’t bad for your teeth on Thanksgiving? Well, your Thanksgiving turkey for one! 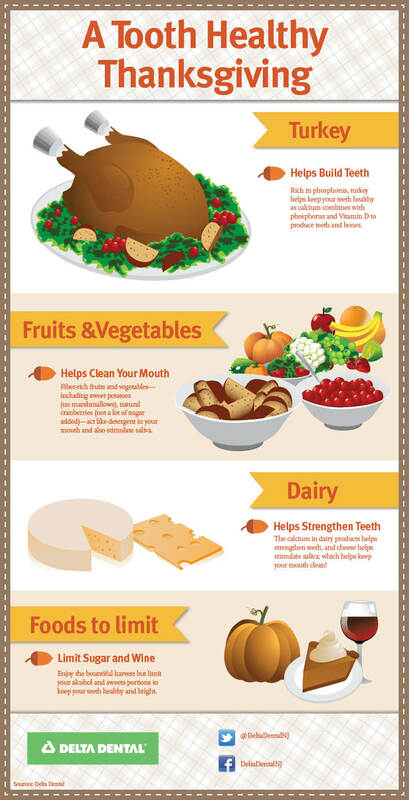 Turkey is a great food for oral health because it is rich in protein. Protein has phosphorus in it – and when the phosphorus mixes with calcium and vitamin D, it creates strong bones and teeth. So even though eating a Thanksgiving feast can make you sleepy, you can rest assured that turkey is a healthy option for a great smile. When in doubt, seek out the veggie tray: Munching on crunchy foods such as celery and carrots is particularly helpful to your oral health. This Thanksgiving, enjoy your turkey guilt-free. If you do indulge in sweets, remember to brush and floss after the meal so you’ll have something to be thankful for even into December – good oral hygiene!